Ray was brought up in Walcot Green on the outskirts of Diss. Nearby was a farm and from a young age he loved helping out, working with all the animals and especially with Captain and Major, the two Shire horses. After leaving school he got a job on Young’s Farm in Diss while studying at Easton College of Agriculture, near Norwich. He joined Diss Rugby Club and played alongside his brother Dennis but after incurring a broken shoulder during a match, he decided rugby was not for him! Ray then moved to Pampisford to work as a pig man at Rectory Farm. He retained a lifelong respect for pigs who he said were far more intelligent than us humans. He had a special favourite at Wimpole Hall – a large Tamworth sow called Phyllis. He would talk to this lovely creature in ‘pig speak’ and she would talk back; and this carried on with any pig he came in contact with throughout his life. After leaving Rectory Farm and working for a spell at the National Institute of Agricultural Botany, he spent the rest of his working life at the National Seed Development Organisation, which later became the Plant Breeding Institute. Ray met his wife Sue while working in Pampisford and they married at St John the Baptist Church there in 1967. They had two daughters – Nichola and Caroline. While the girls were still young, Ray and Sue helped to set up Sawston’s Saturday Morning Music Workshop. Having taught himself to play the clarinet as a child, Ray was particularly keen to impart his enthusiasm for the instrument to other children. Once the girls had left home, Ray and Sue found a love of travel to far-flung places; on one holiday to America, they visited New Orleans where Ray realised his dream of going to a ‘gig’ in the historic Preservation Hall – the spiritual home of jazz. 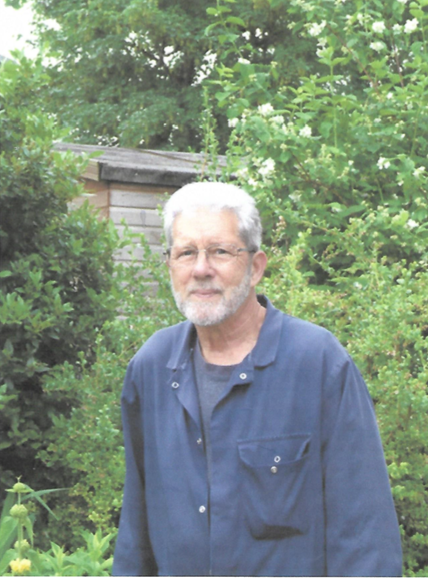 Having taken early retirement at fifty-seven, Ray was always on hand to help out his daughters, arriving at their houses with a set of blue overalls (he had at least twenty pairs), gloves and secateurs. He put up greenhouses, sheds and summer houses, pruned apple trees, chopped wood, mowed lawns and planted vegetable patches. 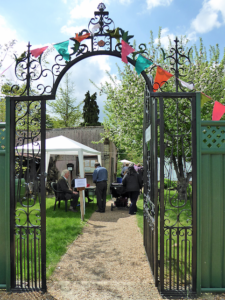 Never ones to pass on a horticultural challenge, Ray and Sue, now in their early sixties, volunteered to help with the rescue of Sawston’s newly acquired Challis Garden. It had been left in trust to the village when the owner Mary Challis died in 2006, and after many years of neglect was completely overgrown and full of derelict buildings. By 2007, it was in need of some serious attention and a group of intrepid enthusiasts began the challenging work of restoration. Ray and Sue were instrumental in getting those first volunteers together for what would prove to be a daunting task. Ray was always referred to as ‘Head Gardener’. I don’t know if this title was formally ordained, or if it simply came about as Ray’s knowledge and leadership became apparent. But it was clearly the right title to give him due to his evident skills and enthusiasm. He led by example and with a quiet, calm demeanour. There was never any fuss nor harsh words and rarely any sign of impatience or disapproval. He was a joy to work with – a great example to us all. He always had time for visitors to the garden, whether answering questions, giving advice or just passing the time of day. 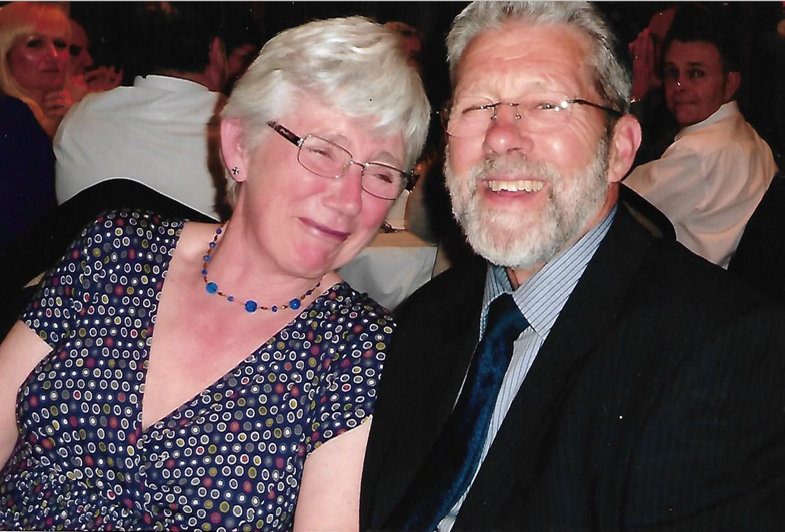 When Sue died unexpectedly in 2012, it was as if Ray had been cut in half; they had been such a close and loving couple. He found it hard to cope without her. But he was amazing. He kept his two allotments going and immersed himself in the Challis Garden, continuing what they had begun together. In this work, he found great solace and peace. When he learnt about his terminal illness, there was no fuss or drama, just a straight acceptance of his condition. He quickly decided that he didn’t want to have any treatment – he didn’t see the point – and he got on with tidying up his domestic affairs, giving up his allotments and bringing his huge collection of garden tools down to the Challis Garden. He was still very involved right up to the annual Horticultural Show in early September this year, manning the plant stand, as he always had done. It was a great privilege to know Ray and his death is a huge loss both to his family and to the Challis Trust, to whom he selflessly gave so many years. Without his commitment, it would not be the wonderful, tranquil oasis it is today, a living lasting tribute to the amazing, irreplaceable, Ray Reeve.